Another once upon a time small fishing village that has grown since the 1960s into a major tourist location. Tall blocks of holiday apartments now dwarf the older area of the town. As it lies next door to the well-known and popular Vilamoura holiday resort it acts as a dormitory location for the many employees and companies involved in the tourist trade. However, it also enjoys its own loyal tourists who return annually to make use of its long open sandy beach and promenade. A little to the east of the town is Fonte Santa where a natural spring is said to have healing qualities. Reasonably close to Quarteira is the inland town of Almancil that is also a centre for service companies. 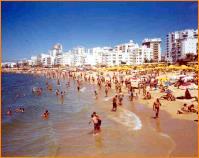 The administrative town of the area is Loulé. 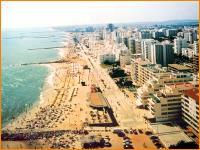 Neighbouring the area is the golf oriented village of Vilamoura that has since the 1960s is one of the main golfing destinations in europe. To the north is the commercial and administrative town of Loulé.